The Government of the Kyrgyz Republic sought assistance from the Food and Agriculture Organization of the United Nations (FAO), through a Technical Cooperation Programme (TCP) project, to strengthen national capacities to monitor and assess the country's forest and trees resources in an integrated land use approach. Understanding the economic value and potential of these resources is important, said Dan Altrell, an FAO Forestry Officer and the TCP's Lead Technical Officer, especially as "the Kyrgyz Republic transitions from a planned economy to a more market-based one." Up-to-date data generated from scientific, evidence-based assessments can inform national policies, legislation and programmes aimed at improving rural livelihoods and sustainability. 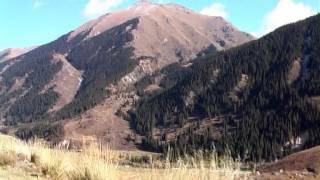 Forest coverage is relatively modest in the mountainous Kyrgyz Republic − roughly 5.6 percent of the country. Yet more than one million of the nation's 5.5 million people live in or near forests, relying on wood for heating and construction. For many households, walnuts, pistachios and fruit, such as apples, pears and plums, provide food and income. The country's forests also play a crucial role in preventing soil erosion, mudflows, landslides and avalanches. They regulate mountain run-off so that rivers flow more evenly throughout the year − important for the Kyrgyz Republic and other Central Asian countries where farming relies heavily on irrigation. But decades of overuse, including intensive livestock grazing, particularly during Soviet times, have taken a toll on the country's natural resources. Logging, as well as fires to clear land for farming or pasture, have damaged or destroyed forest cover. In addition to degrading soils and habitats, these activities release carbon dioxide and other harmful greenhouse gases into the atmosphere, said Dinara Rakhmanova, Assistant FAO Representative in Kyrgyzstan. "Sustainable forest management is a new notion for the Kyrgyz Republic," she said. "With this project we've made a big effort to raise awareness among local communities on the importance of saving the biological and landscape diversity, as well as the environmental functions and the aesthetic and recreational values of existing forests," she added. Before the project, the country had an incomplete picture of its forest resources. In 2005, national surveying crews inventoried about 60 percent of the state-administered forests, leaving a significant information gap. Moreover, inventories focused mainly on timber production rather than on the multiple ways forests benefit local communities − environmentally, socially and economically. The project, therefore, aimed to help the Government design and carry out a comprehensive national forest inventory on all forest types and land properties. The project was carried out in two phases, in partnership with the State Agency for Environmental Protection and Forestry and with additional funding from the Government of Kyrgyzstan and the Swiss-Kyrgyz Forestry Support Programme. The project brought together major stakeholders working on forest and tree resource management, civil society, NGOs, forest services, scientists, line ministries and international partners, to agree on a sector-integrated approach to assess the country’s forestry resources and their multiple functions. Such an approach is crucial for meeting national information needs, and for gaining a better understanding of the relationship between plant biodiversity and carbon storage. The stakeholders also reached consensus on setting up a long-term natural resource monitoring system. More than 50 staff from the Department of Forest, Hunting and Ground Inventory (DFHGI) received training on national forest management assessments, including analysing, managing and disseminating collected data. A national forest vegetation and land use classification system for remote-sensing surveys was developed. In addition, FAO and the DFHGI worked closely to design a database to store and manage information from the forest and land assessments. The project team published findings from the assessment in both Russian and English to help get the word out on the state of the country's forests and natural resources. One of the biggest achievements was in strengthening country-level capacity, said Altrell − and in galvanizing stakeholder support. "There's strong national ownership," he said. "The Republic had very few means, but they were driving this project, making new partnerships and alliances to support the inventory." The inventory identified forests outside of state-owned forest funds and protected areas not previously included in official statistics. 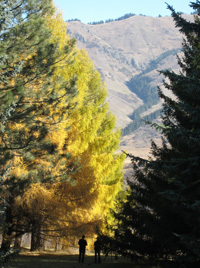 As a result, national forest and shrubby vegetation coverage was updated from 4 to 5.6 percent. The Government officially adopted these new figures and has begun to review and amend existing national forest legislation and policies to cover these areas. Furthermore, the project's results served as a baseline for a national forest policy, developed by the Government in consultation with local authorities and communities, NGOs and other stakeholders, that will run until 2025. It also served as baseline information for several new FAO projects. One is a nearly USD 5.5 million project, funded by the Global Environment Facility, on sustainably managing the Republic's mountain forest and land resources under climate change conditions. Another is a more than USD 5 million German-funded project on national forest monitoring and information systems for a transparent and truthful REDD+ (reducing emissions from deforestation and forest degradation), targeting 18 countries, including the Kyrgyz Republic. Keeping the momentum going is crucial. That means having the wherewithal to repeat such national assessments regularly and to be able to generate and manage new data. The country continues to face big environmental challenges, like erosion, that cut across sectors and that require an integrated approach. There is a need, for example, to find a better balance between livestock breeding − an important livelihood source in the Republic − and sustainable natural resource management. "These types of assessments are important because they provide good information for decision-making not just on forestry but on agriculture, livestock and water management," said Altrell. FAO's TCP projects are targeted, short-term catalytic projects that leverage FAO's technical expertise to address specific problems in agriculture, fisheries, forestry and rural livelihoods among FAO member countries, producing tangible and immediate results in a cost-effective manner.